Lyle the crocodile lives happily with the Primm family, until one day his world is turned upside down. 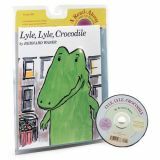 His neighbor, Mr. Grumps, has Lyle committed to the zoo because Lyle frightens his cat and because, well, he's a crocodile. When zoo life doesn't measure up to life with the Primms, Lyle and his former stage partner make a break for it . . . Will Lyle ever see his adoptive family again?